Homemade crispy shells are a serious taco night upgrade. Baked shells are crispy and so much more healthy than fried. 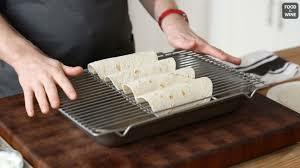 Using a baking pan, lay a baking rack on top of the pan. Drape tortillas over the rack wires, making an upside down U shape. Bake for 10-15 minutes, or until crispy. You can also bake them on your oven rack, but they are not fun to remove. Fill with desired filling for a crispy, crunchy, healthy taco.